Electroconvulsive therapy (ECT) is commonly used to treat major depression and other psychiatric disorders when patients are unresponsive to pharmacologic management. ECT is generally safe and effective, if applied appropriately. A sufficient duration of seizure induced by appropriate amplitude of current is likely to produce optimal outcome. ECT stimulates sympathetic reaction, and elicits significant adverse physiological responses, including cardiovascular (e.g. hypertension and tachycardia) and central nervous system (e.g. increase of intracranial pressure and cerebral blood flow). 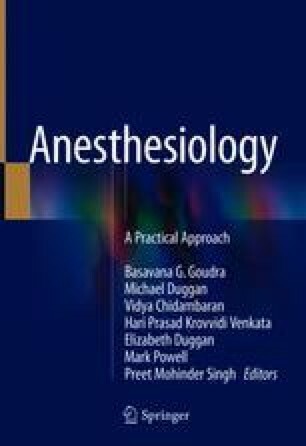 Thus anesthesia preoperative evaluation should identify patients with significant comorbidities, whose medical condition should be optimized by consultation with proper anesthesia plan before the procedure. Although different anesthetic regimens can be used, the goal is to minimize the anesthetic factors on the efficacy of ECT treatment, while maintaining adequate depth of anesthesia and ensuring patient’s safety. In many hospitals, ECT is often performed at remote sites; anesthesia providers should be well prepared for escalation of care and resuscitation if necessary.